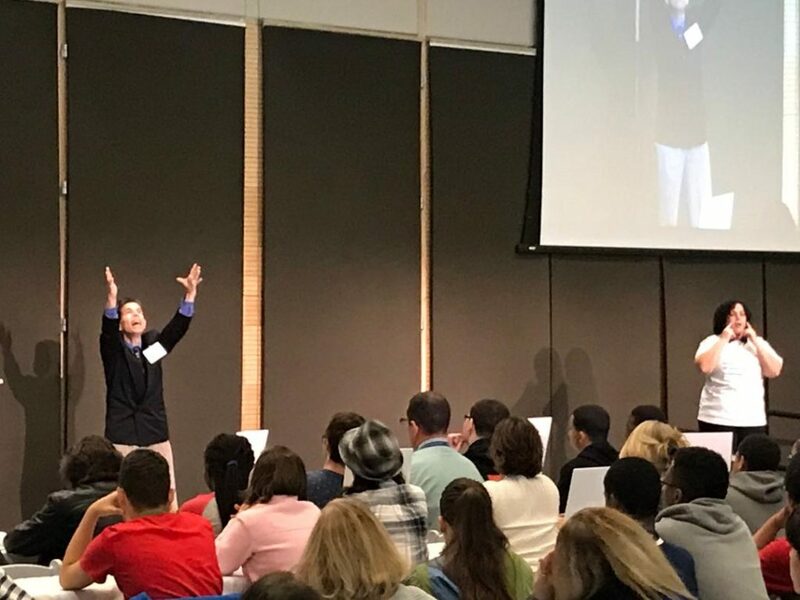 A passionate TED Talk speaker and author who has triumphed over cerebral palsy and a hearing loss, Dr. Paul Wichansky instills in students the motivation and perseverance needed to help his audiences soar towards success. 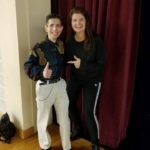 During the past 36 years, since age 10, he has hosted an estimated 7500 presentations on the topics of diversity and disability awareness, character education, anti-bullying, and empowering our youth. 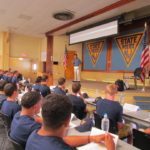 His uplifting assemblies encourage students to ensure their names become symbols for success as they learn to embrace the ideals of confidence and leadership that help make their lives a success story. 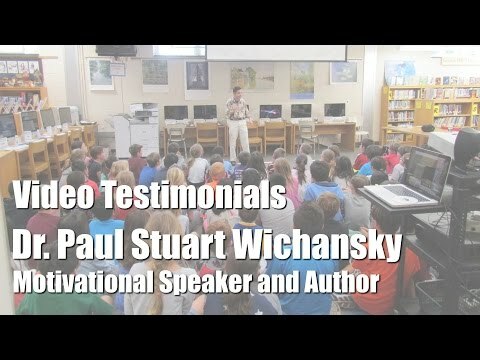 Dr. Paul had a very busy series of speaking events to close out the year. 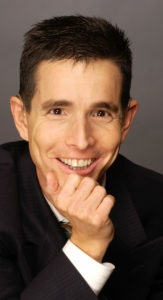 He spoke at various elementary, middle and high schools and keynoted some special events. 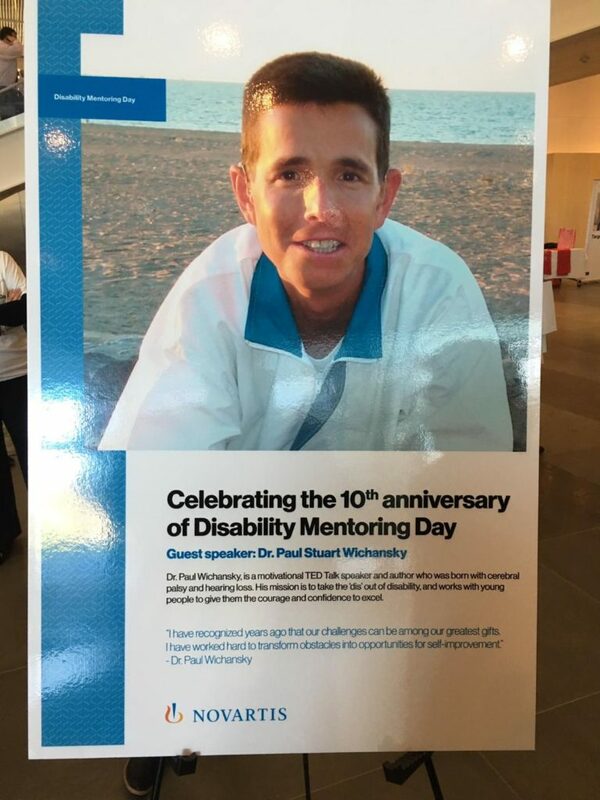 Dr. Paul keynoted the 10th annual Disability Mentoring Day event at Novartis in East Hanover, NJ. 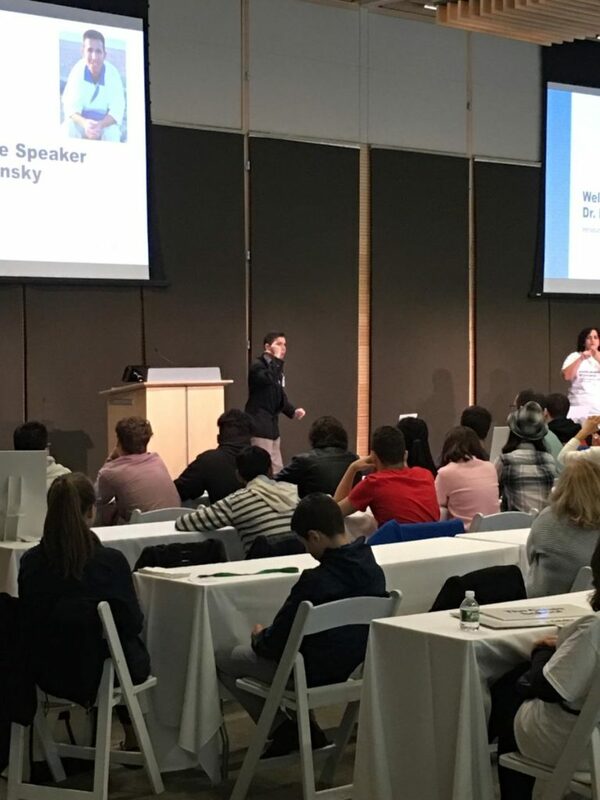 He spoke to a group of high school students from area high schools and to Novartis employees and executives on “Taking the ‘Dis’ Out of Disability”.. Novartis President of Pharmaceuticals US, Fabrice Chouraqui, was apparently so captivated he stayed for the entire keynote. Another employee commented, “Dr. Paul, I’ve been at Novartis for several years but your keynote blew all our other speakers right out of the water. Because YOU made our Morris County students feel so heroic! 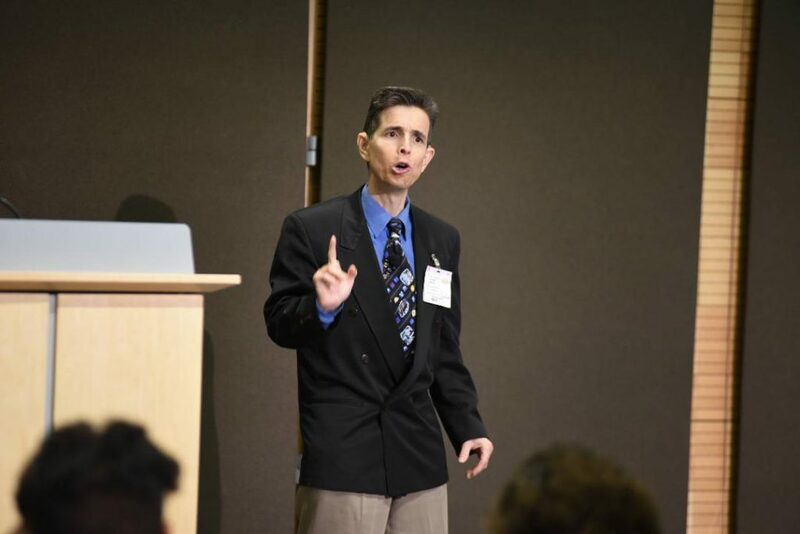 “You’ll hit obstacles you’ll need to go around or over to achieve your goals,” said keynote speaker Dr. Paul Wichansky, a motivational speaker and author who was born with cerebral palsy and hearing loss. “Stay focused on positivity and hope. Don’t give up; find another way to reach your goal. 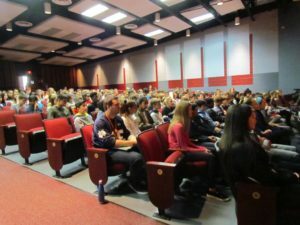 The Principal of Washington Township High School in Sewell, NJ, Ann Moore, invited Dr. Paul to speak to students with his presentation called “Access To Success”. Dr. Paul inspired 2300 students in grades 9-12. 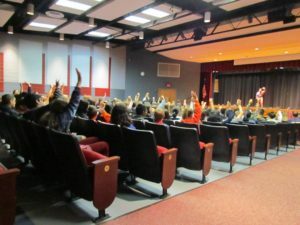 He emphasized the topics of substance abuse prevention, peer leadership, and anti-bullying. 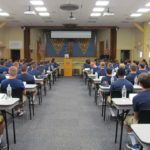 His presentation educated students about hope, optimism, and perseverance in reaching goals and achieving success. 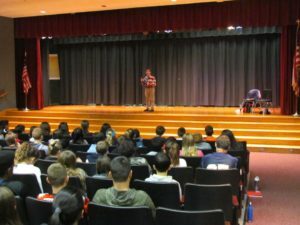 Cavallini Middle School in Upper Saddle River, NJ invited Dr. Paul to speak for the 10th consecutive year. Dr. Paul spent the entire school day at Ann Street School in Newark, NJ doing assembly programs and visiting individual classrooms to answer questions. Ann Street School is a National Blue Ribbon School that invited Dr. Paul in to inspire students in grades 1-8. 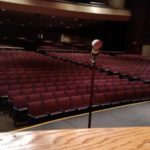 Dr. Paul shared the stage at the school that has hosted mayors, governors, and senators of New Jersey, even the U.S. Vice President!